It's that time of year again where I recap the best my photography skills had to offer for the year. Some Lasius interjectus workers retrieving their root aphid stock which over wintered as eggs from the previous autumn. These herds of insects will nourish the colony in the coming year. 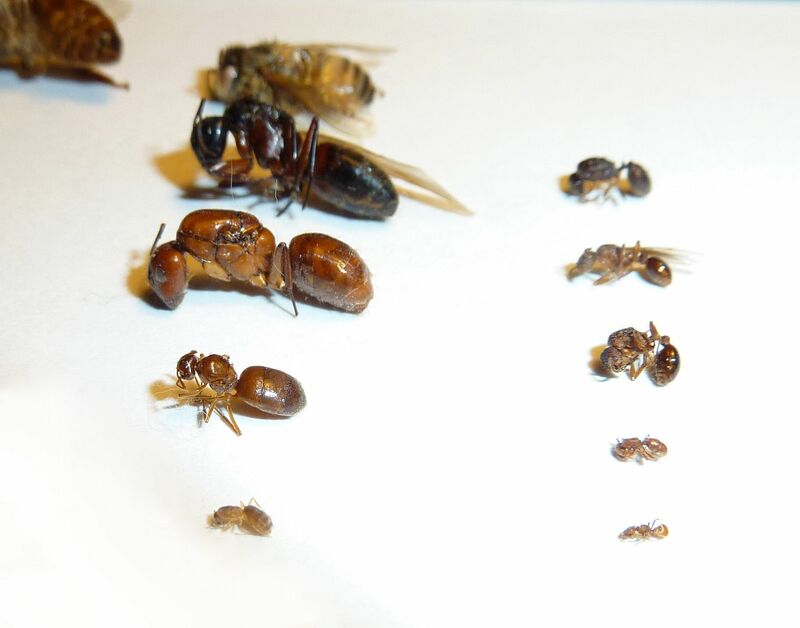 A Prenolepis imparis, Winter Ant, queen and male escorts. 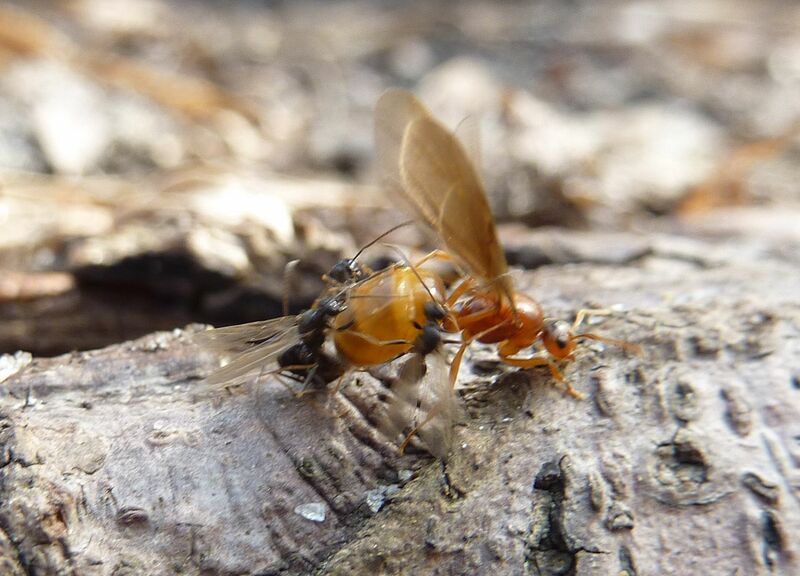 Nuptial flights to this species are fairly predictable taking place on the first few warm days (~70F) of the year. Queens take flight in the afternoon and are out numbered by males roughly 200 to 1. Mating happens in swarms low to the ground or otherwise at eye level. I've always loved how queens are such a robust color. Male ants universally are almost always black for species the world over. Very few deviate away from this standard. This isn't a particularly great photo. I just love that I finally got around to taking pictures of my Pyramica specimen. 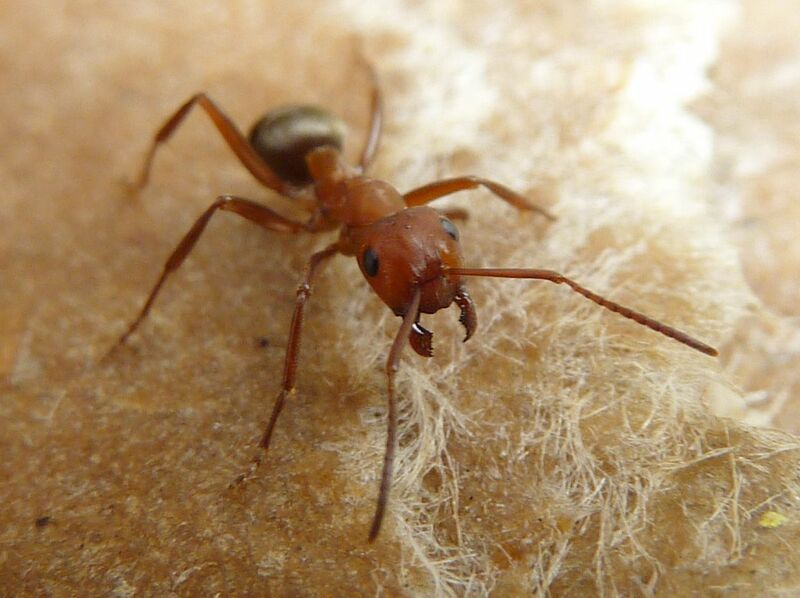 This is a genus comprised of subterranean hunters that specalize in small arthropods and collembolans. Because they're subterranean one has to more or less chance upon them or sift through the right material. Around the world this genus gets quite colorful. Check them out on Ant Web. The same is true for my Proceratium specimen. These use a different method of hunting. The tip of their abdomen is unusual looking because the tip naturally curls around to point forward. This makes stinging pray items easier while hunting in tight enclosed spaces. Lasius interjectus workers scrambling to protect the larva after a photographer disturbs the nest. The perfect shot of the clypeal notch (between the mandibles) to a Formica pergandei worker. 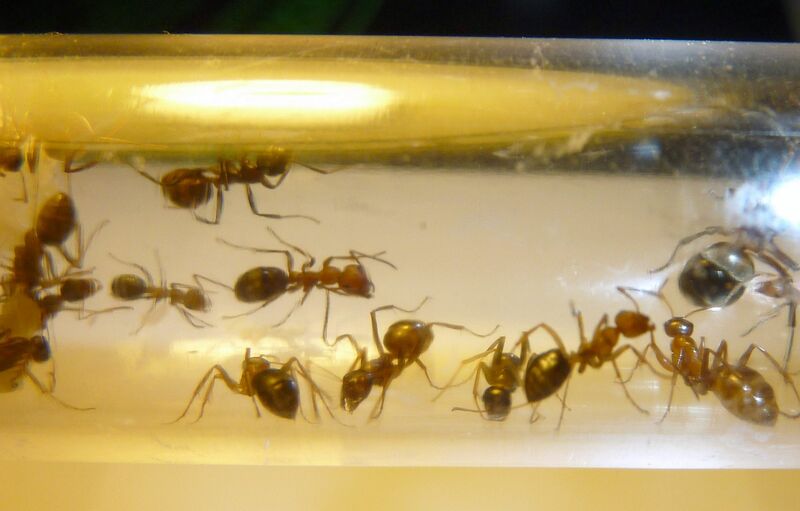 Formica is one of the largest genera of ants in North America, though not the world. From your back yard, to the peaks of the Rocky Mountains, there is a species to fit every notch except the arid south. To confuse matters even more it's a genus filled with social parasites and slave makers of other Formica. That notch in the middle of the clypeus means this species is in the Sanguinea subgroup, making identification a choice between 11 species instead of 100. Another Formica worker. This time Formica subsericea which is the most common and widely distributed of the darker members of the Fusca group. The Fusca species in Formica are the most industrious of the host groups. 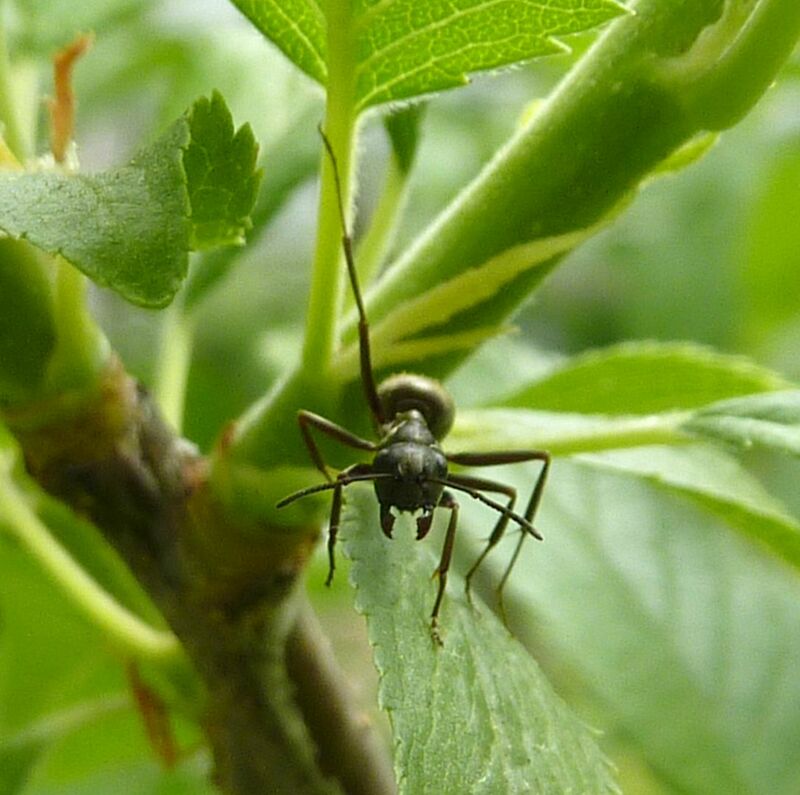 Their colonies tend aphids and other sap producing insects from multiple trees at a time during the day. Mixing two of my favorite things, ants and Trilliums. Trillium simile is one of my favorites because the petals come to form a triangle. 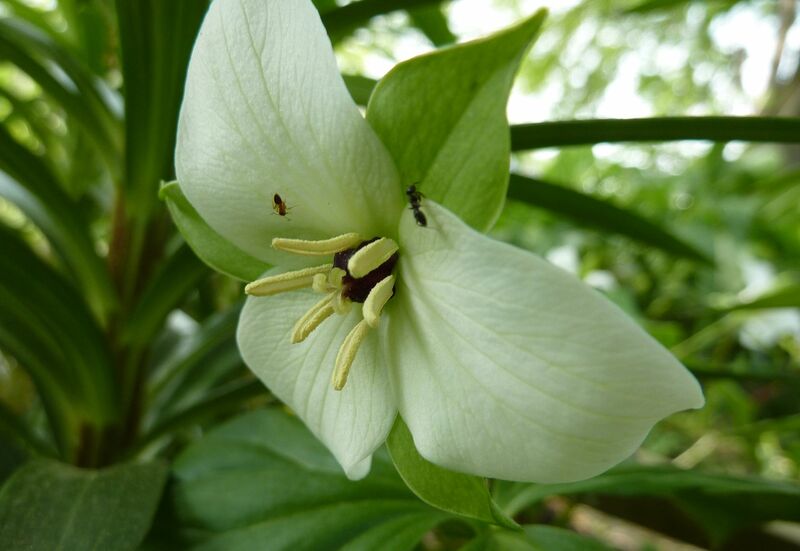 When grown in a group they have an architectural effect I like, though you'll get that from masses of any Trillium species. 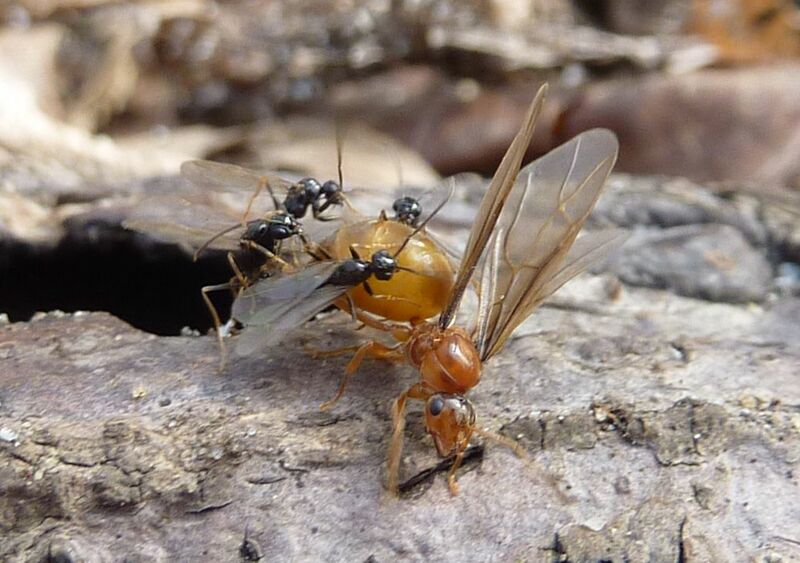 The ants are Tapinoma sessile (black) and Nylanderia flavipes (dark orange) which I have found to be notorious for stealing nectar and at the same time eager for seeds to develop. 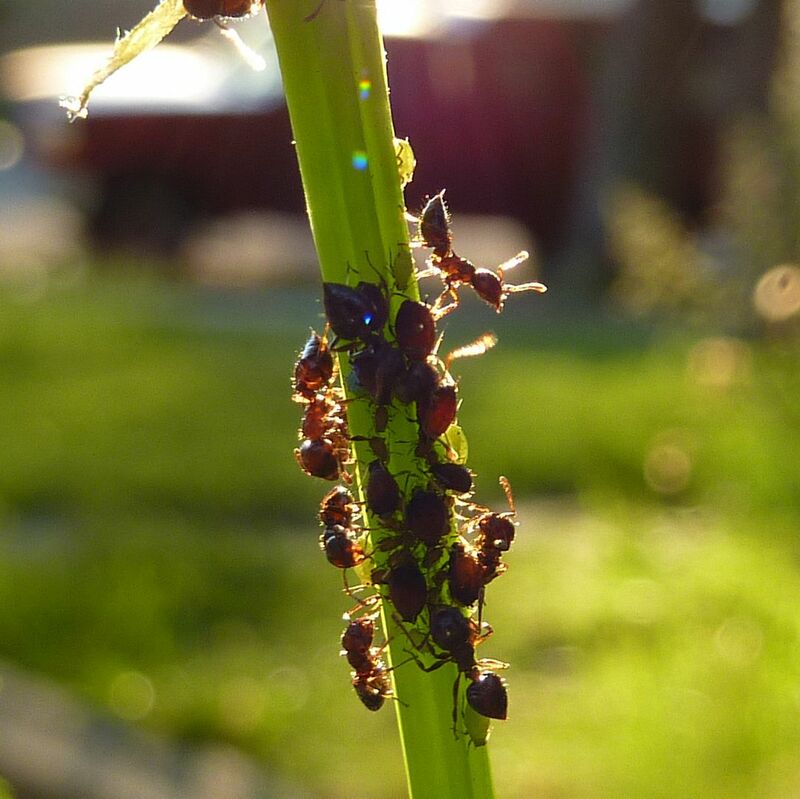 Crematogaster cerasi workers tending aphids in the sunset. 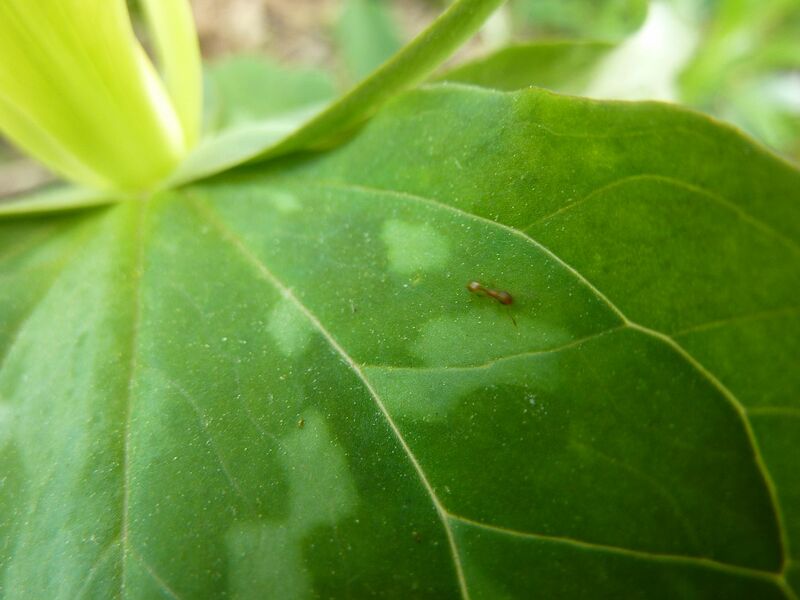 An insignificant little ant, possibility Temnothorax, roams a Trillium leaf in search for food. 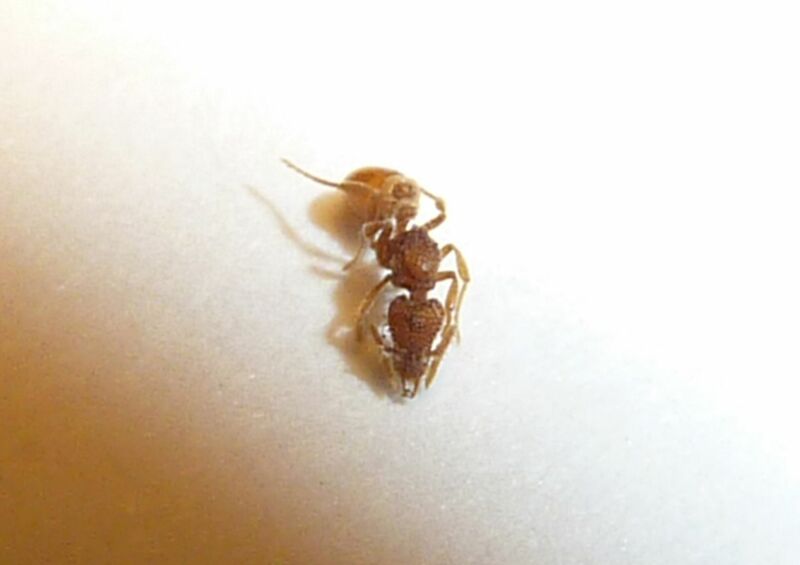 A rather small queen ant in the genus Stenamma. I didn't even know this genus existed in New Jersey let alone my backyard but here it is. Seeing her brings into question all of my identifications of the smaller ants like the Temnothorax above. 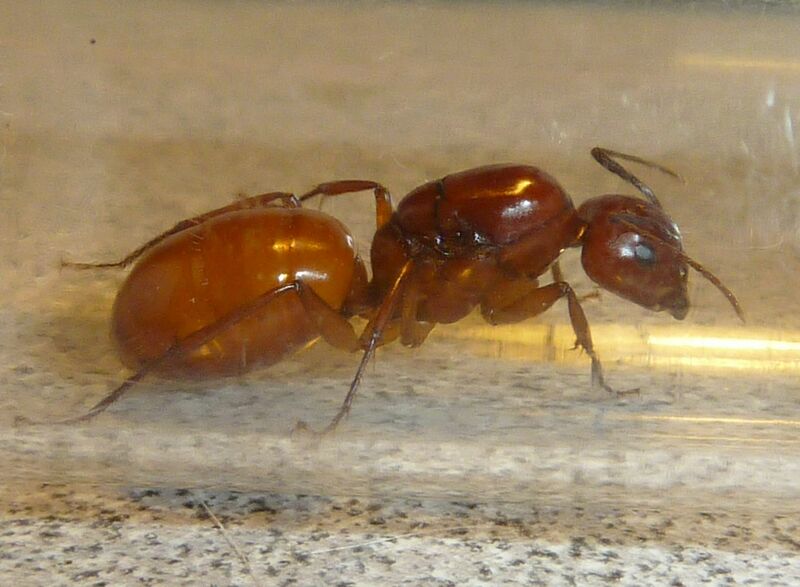 A Camponotus castaneus queen I caught earlier this year. 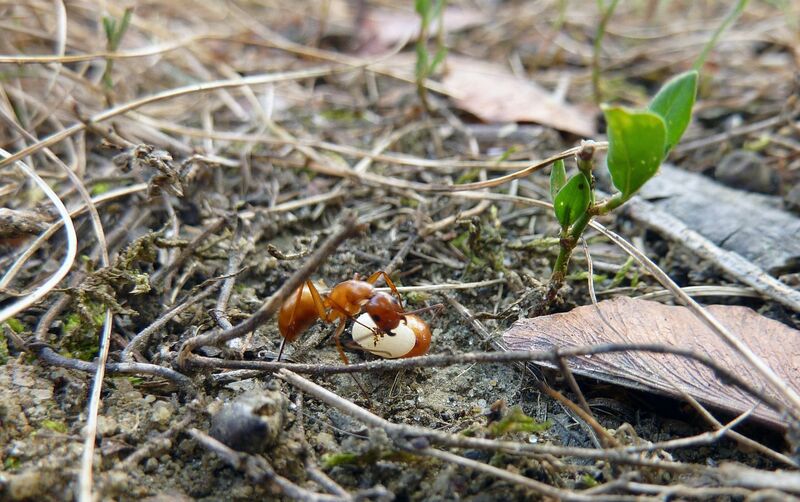 I love this species because it's the only solid orange ant around here in that genus. 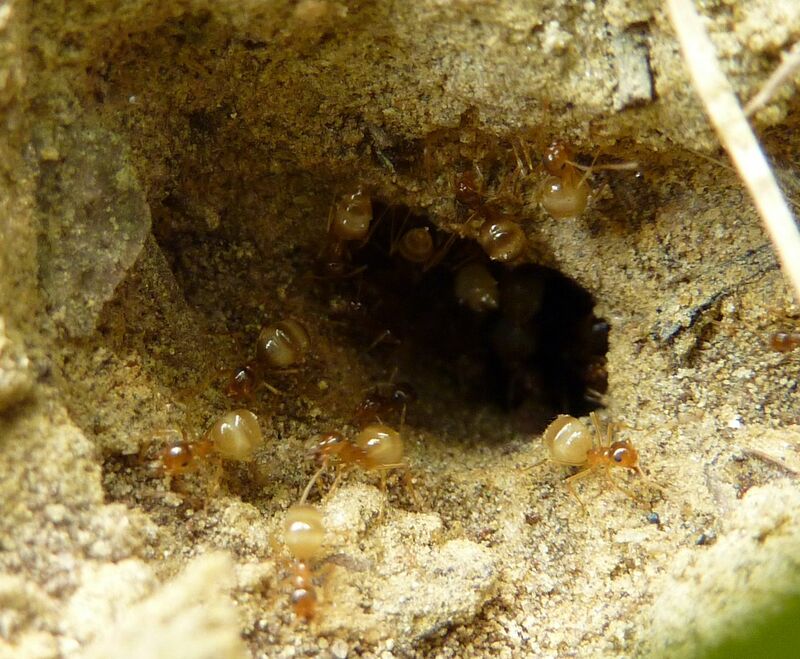 Prenolepis imparis colonies slowdown once summer hits. 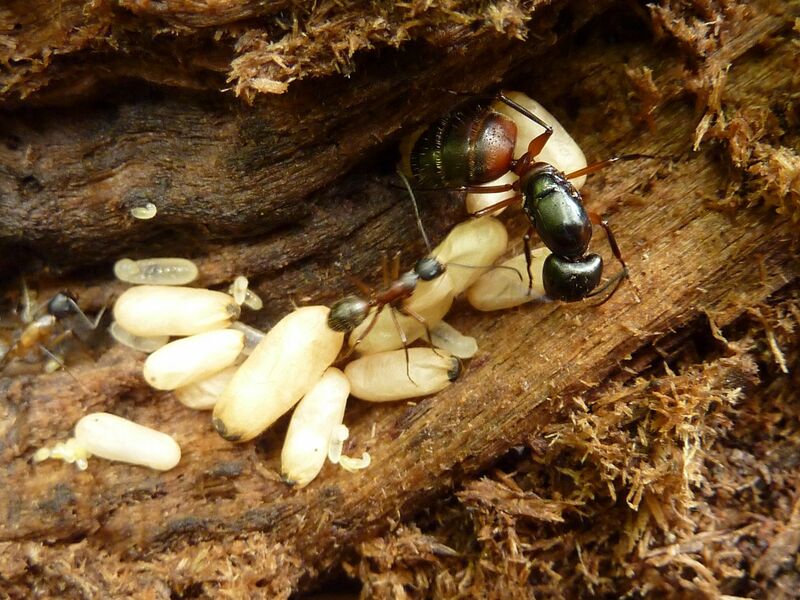 Their workers inflate with food and are put to work digging tunnels to make the nest deeper. They'll retreat to the damper parts over the summer and move back towards the surface as the rains come back again. Before winter hits they'll eventually be the only species out foraging long after other species have gone into hibernation. 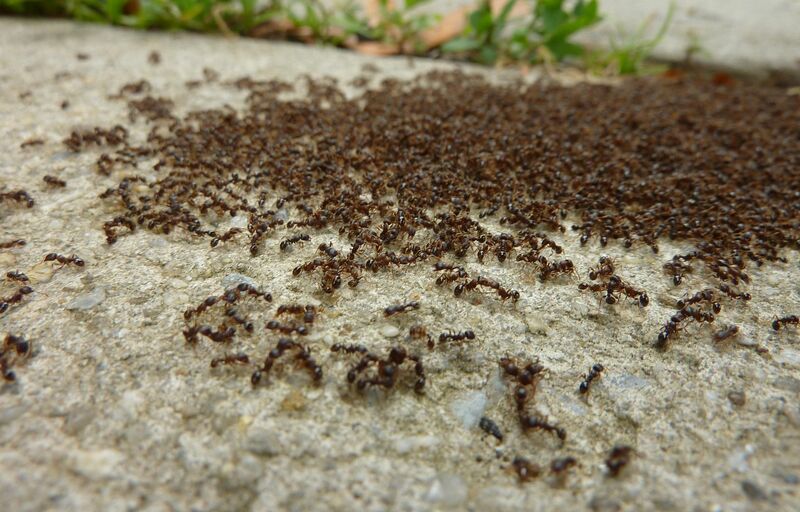 They're not called the winter ant for nothing. 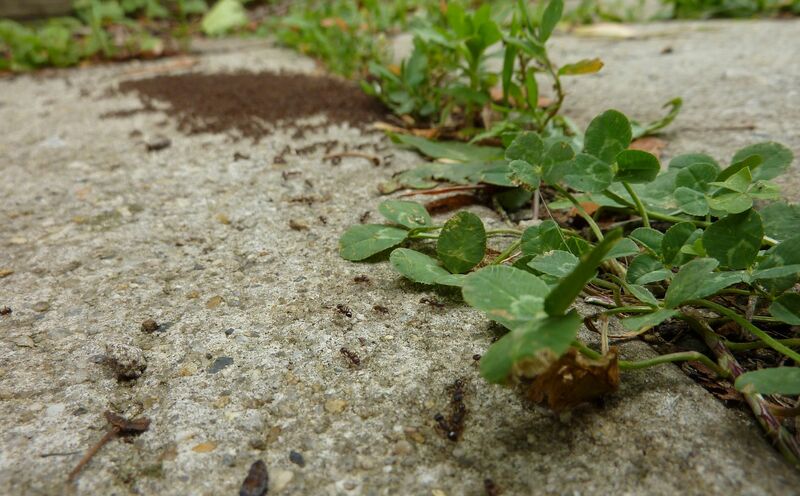 An ominous black stain in the late spring/summer time is more than likely a battle between two colonies of pavement ant, Tetramorium species E. (The E is thanks to their taxonomic limbo at the moment... I wish they'd made it stand for something at least like erecta. Alex Wild who is a very well respected insect photographer featured this image on his blog. Though he color corrected it to make a better image. This species is normally black in color but a few colonies around here tend towards being dark brown or slightly bicolored. While baiting the yard with honey here and there it's easy for anyone to check the ant diversity hanging about. 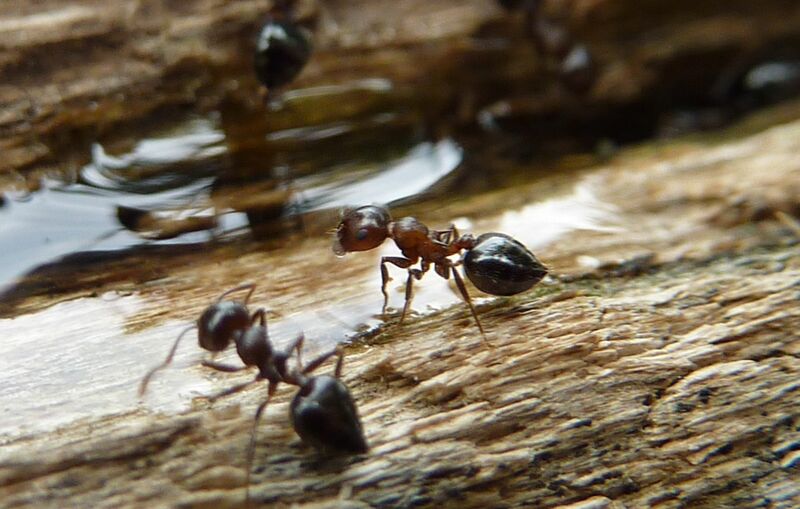 Here some Crematogaster cerasi workers sip at a small pool of honey. While having a friend over one day I mentioned I have random workers to a species that seems to be starting up in my yard. As luck would have it we moved an old log in the garden to look under, but it broke open in the process and revealed the nest chamber and queen to the ants I'd just mentioned to him. Camponotus chromaiodes is very common in the Pine Barrens and I'm thrilled they've decided to nest here. They differ from Camponotus novaeboracinsis in the amount of hair on the gaster/abdomen and the amount of red on the mesosoma. C. chromaiodes always has black shoulders while C. novaeboracinsis is solid red. 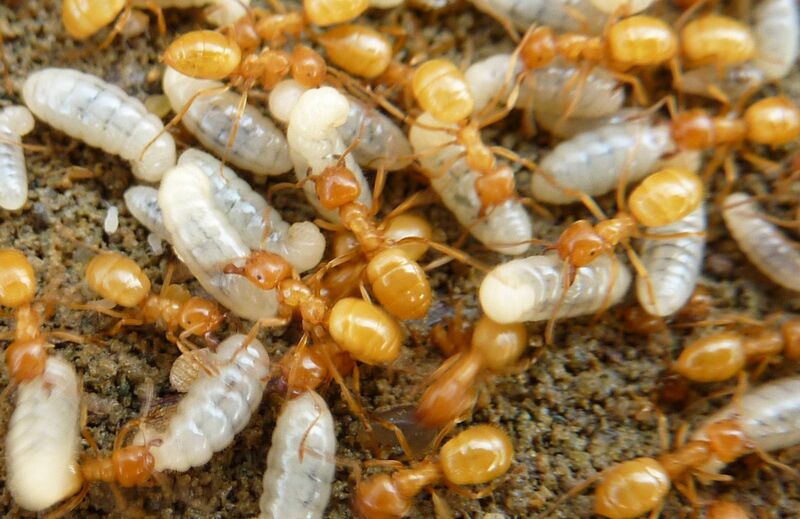 These traits vary somewhat within the colony but are the standards among the largest workers in the colony.The color patterns of queens is another matter. C. chromaiodes is as seen above, with a little bit of red under the mesosoma and somewhat on the gaster. C. nobaeboracinsis queens tend to have more red on the mesosoma and less on the gaster. 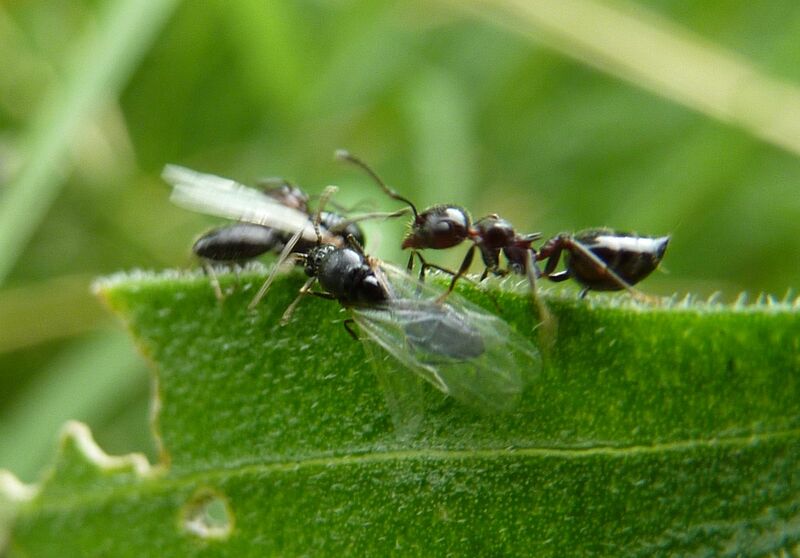 A Crematogaster cerasi workers and male posed on a leaf. A successful experiment I did where I documented and allowed 4 colonies of Prenolepis imparis to combine. The colony is still together to this day. 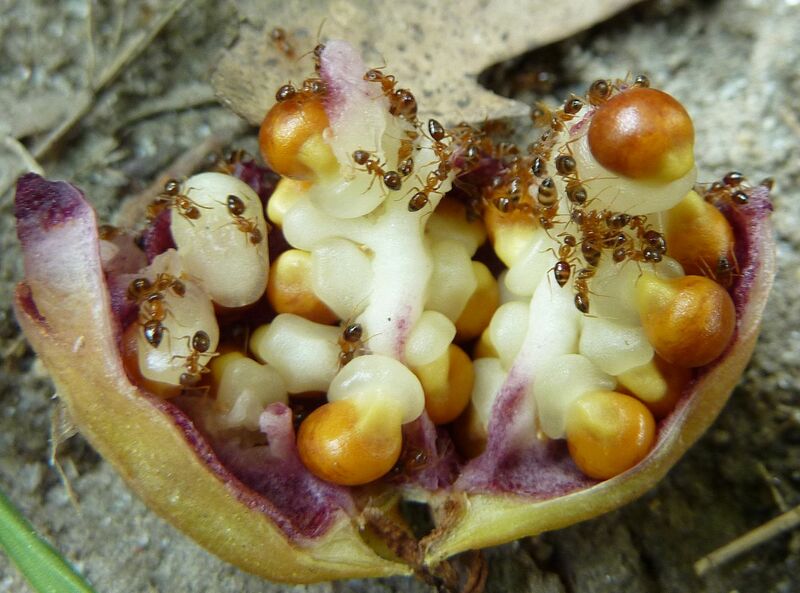 An Aphaenogaster rudis workers walking among the Trillium seeds. 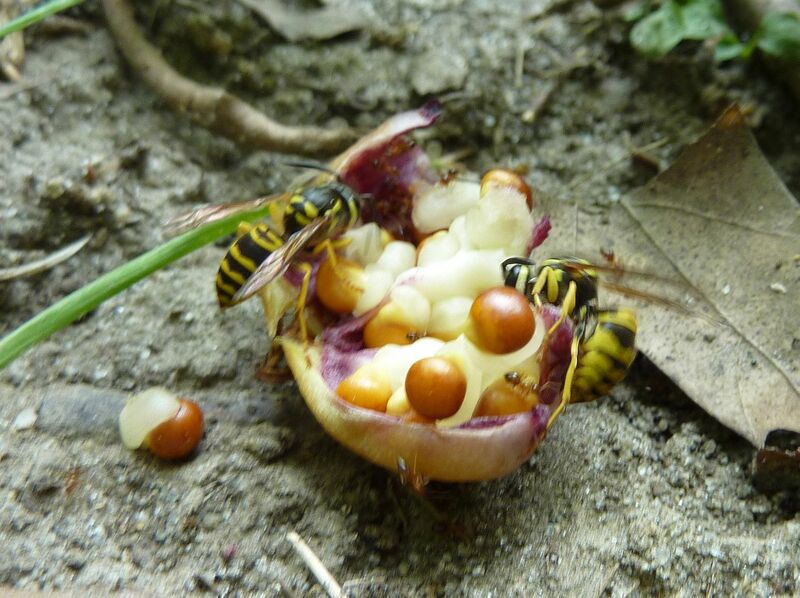 Yellow Jackets stealing Trillium seeds and potentially planting or dispersing them perhaps? Hordes of Nylanderia flavipes eating the elaiosome off of the Trillium seeds. 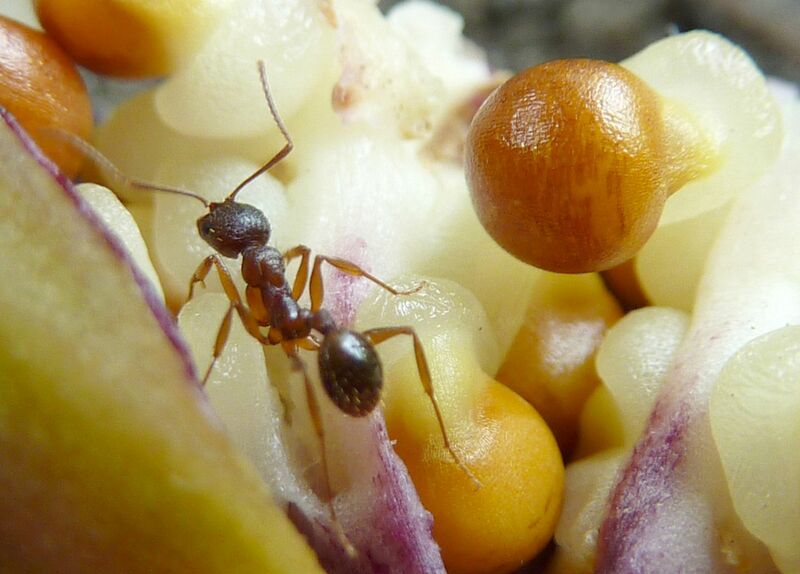 Because these ants are too small to carry the seeds they simply remove the ant food in place. 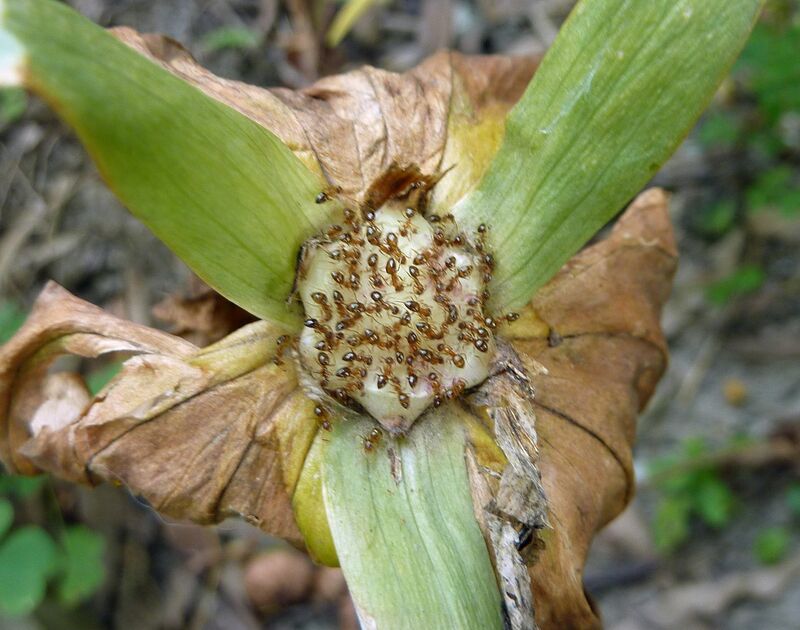 Sadly this negates the purpose of the elaiosome which is intended to get the ants to carry the seed into their underground nest, effectively planting the seed. Nylanderia flavipes polishing off the fleshy material where the Trillium seed pod once stood. 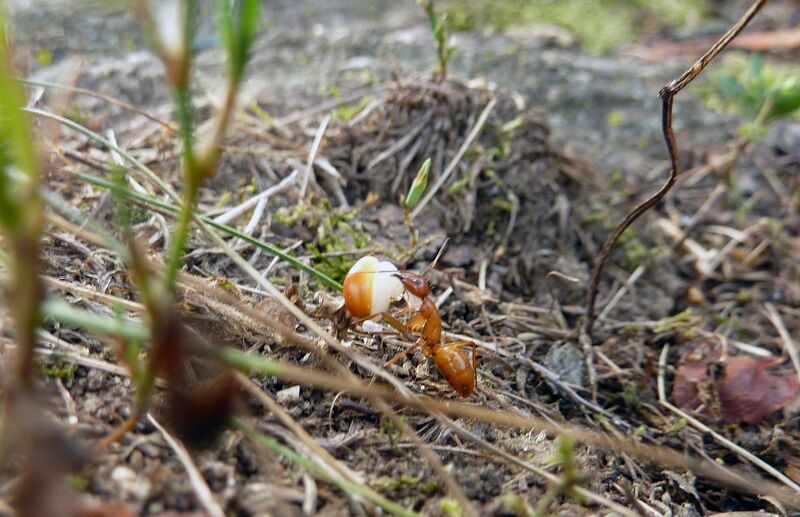 This just says it all about what scavengers ants are; they're finding nourishment in what amounts to connective tissue on the plant. A massive Camponotus castaneus worker has no trouble carrying a Trillium seed home single handed. It's one of the few species that are both willing to carry the seeds away from the plant and are bigger than the seed itself. Of course if the thing had a handle it might be easier to carry. 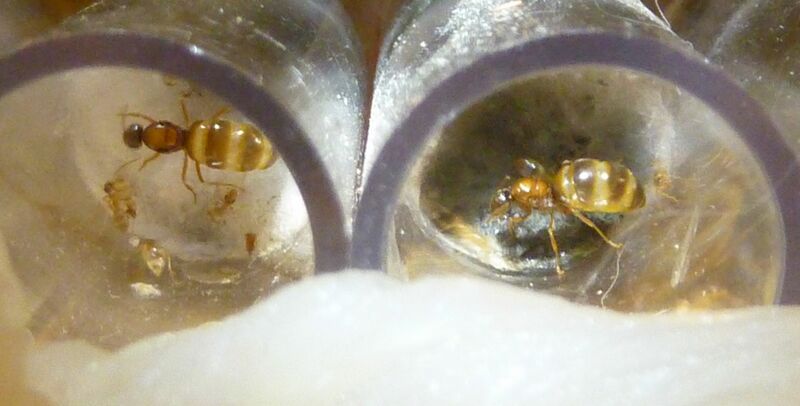 Lastly we have my colony of Formica pergandei and their host Formica pallidefulva and F. incerta workers. 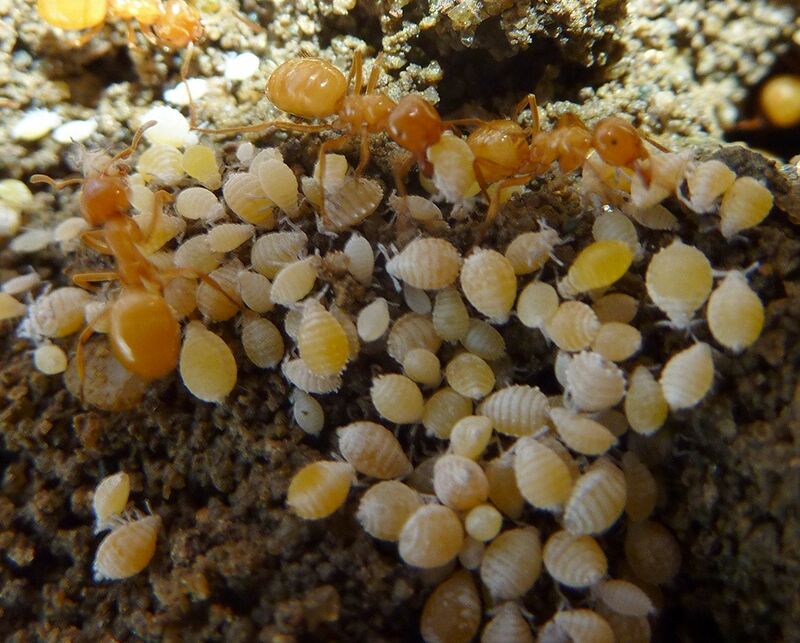 F. pergandei colonies can not maintain themselves using their own workforce. They have specialized in stealing cocoons from other Formica species which are then raised as workers of their own nest. There is some evidence though these devoted slave makers weren't always this way. Note the tiny worker in the middle left. 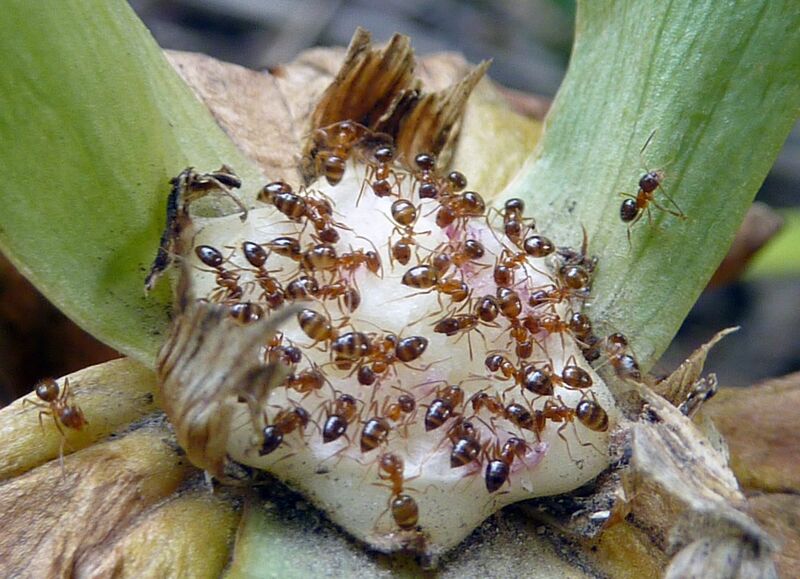 Callow castes are often the first ants new queens produce; they are cheaper to make and smaller than the average worker of an adult colony. Their job is to help the queen produce the next generation of workers. Eventually callows are never produced again in favor of larger more standardized workers. True slave makers would never have any use for such a caste and yet here it is. At the very least they seem to help the colony transition into devoted slave makers, though I would be surprised if they were produced beyond the first few broods by the queen. Hopefully I can keep this colony alive and report more on them in later posts. 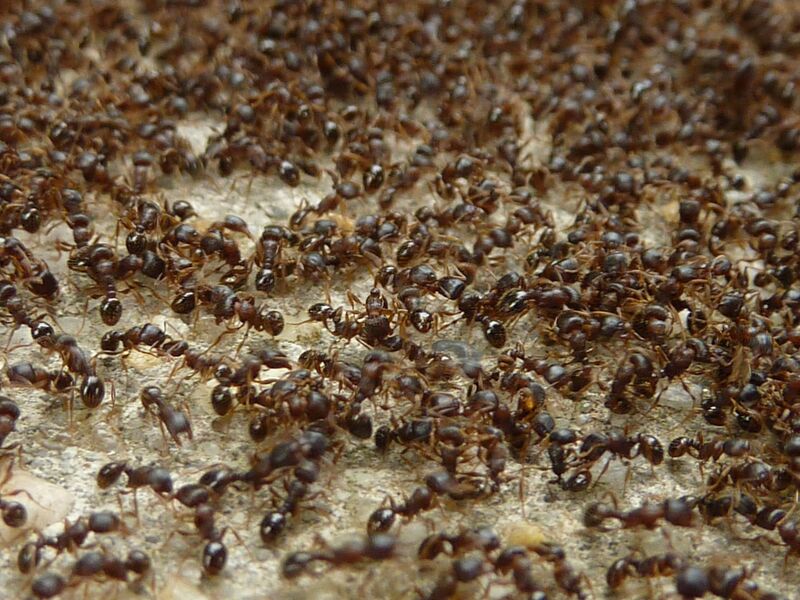 I may even try to setup a fragment colony of host workers and brood so I can document them raiding it someday. I like your blog, and I was wondering about your winter ant colony because I was trying to make my own. 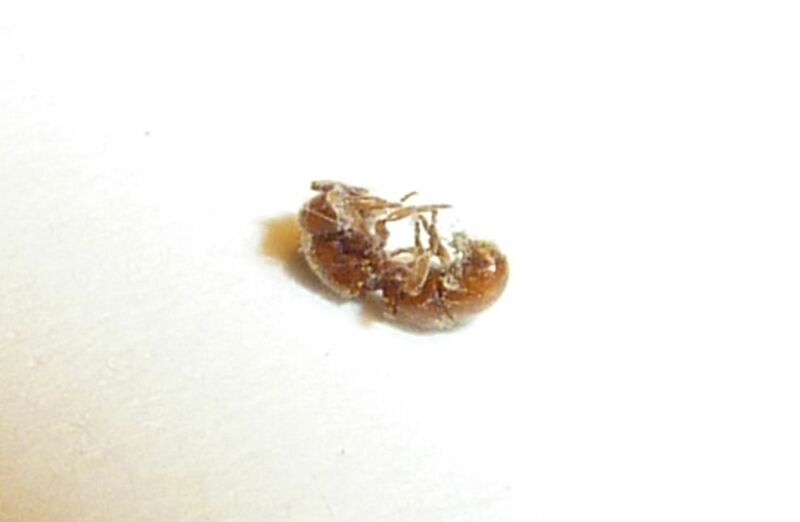 I have the queens but they haven't laid any eggs, and its been three weeks. I live in California but it's kind of chilly right now. Do you think I need a heating pad? A major issue I've found with P. imparis is they eventually stop laying for the winter and if they don't start up next year or fail to raise a second brood, the colony will very likely fail. I don't have an answer for this problem. Your ants aren't quite there yet. I would separate the queens to be individual colonies. 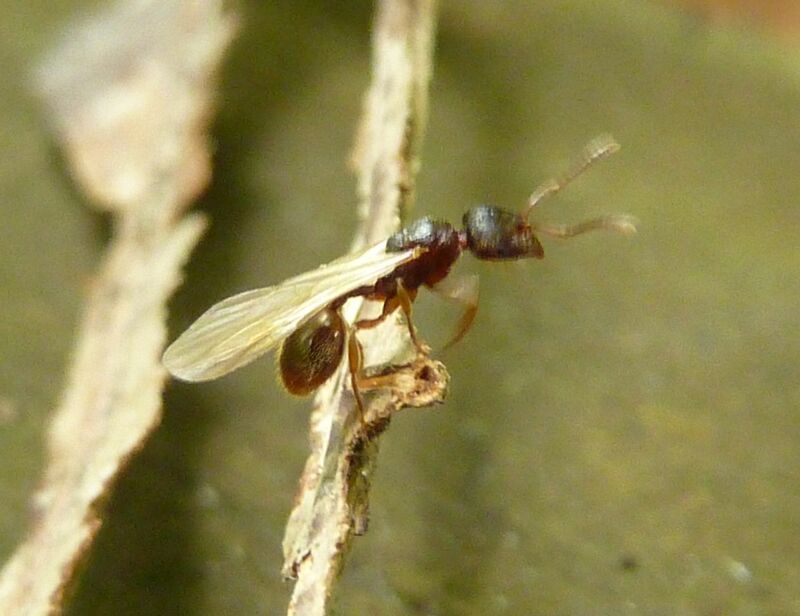 Prenolepis imparis is more than likely several unrecognized species in the US. Heating shouldn't be needed at all. Really you can't do much else than wait.